Party Excitement can help you bring your team together and say thank you to your employees and clients for another year of hard work. For the upbeat and energetic office, let Party Excitement create an exciting night of dancing that your team will talk about for months to come. Our DJ’s will read your crowd and play the perfect music to keep the dance floor packed all night. Our uplighting, custom dance floors, photo booths, and more, will transform the room and create a party atmosphere for true celebration. For those hosts who want something other than back-to-back hours of straight dancing, allow Party Excitement to lead your team in a little friendly competition. We can host music, movie, TV, and specialized trivia, as well as interactive games, as an element of extra-entertainment for your guests. Your employees or clients will not only love the challenge and silly excitement, but your team will bond in a fun way outside of the office walls. We can also create a theme to celebrate your holiday party. 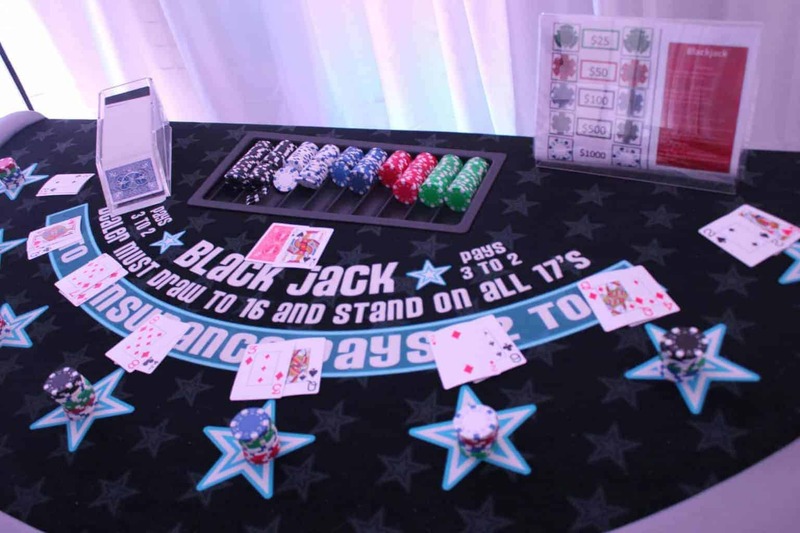 Host a casino night where your employees can playfully gamble with funny-money. Enjoy the carefree night as Party Excitement brings the casino to you, including blackjack and poker tables with live dealers. Or maybe your office goes crazy over March Madness and the Super Bowl, so a sports theme would be the perfect way to celebrate your holiday party. Party Excitement can set up several sports games for your team to enjoy, including basketball, foosball and more. Learn more about all the extras Party Excitement can offer. But what if you’re not sure that renting a large venue or hall is in the budget this year? Not to worry; there’s no need to leave the office to celebrate with your team. Party Excitement can turn your office into an entertainment haven. We will work with you to make just about any space — from conference rooms to lobbies and more — the perfect party venue. No matter what holidays you are celebrating, Party Excitement can cater to a combination of them all, or keep the event a neutral celebration without mentioning any specific day. Our team works to make every guest feel included. Have something in mind for the perfect way to say “thank you” to your team? Reach out to us at info@partyexcitement.com and let Party Excitement throw an event your office will never forget.